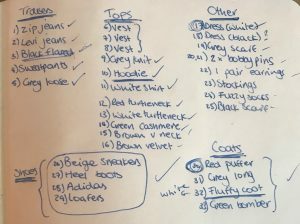 Here in New York, I’ve been exposed to the excessive desire and love for a big wardrobe, and a large amount of clothes. Of course, being into fashion myself and having it as one of my majors, I’ve fallen into this trap before. To start off with, I have one closet for my trousers (jeans, skirts, shorts etc) and one closet for my tops (shirts, sweaters, blouses etc). At the moment, I think that this is excessive. Before I started this project, I recorded which clothes I wear versus the amount that I don’t wear. More than half of my clothes have not been touched since the beginning of the semester. When this assignment was posted, I took it as the perfect opportunity to work on this bad habit, as a project. My first step was to select all 33 items of clothing. Once this was done, I moved the 33 pieces into one closet, and everything else into the other. Then, I locked that door and left it with the doormen downstairs. 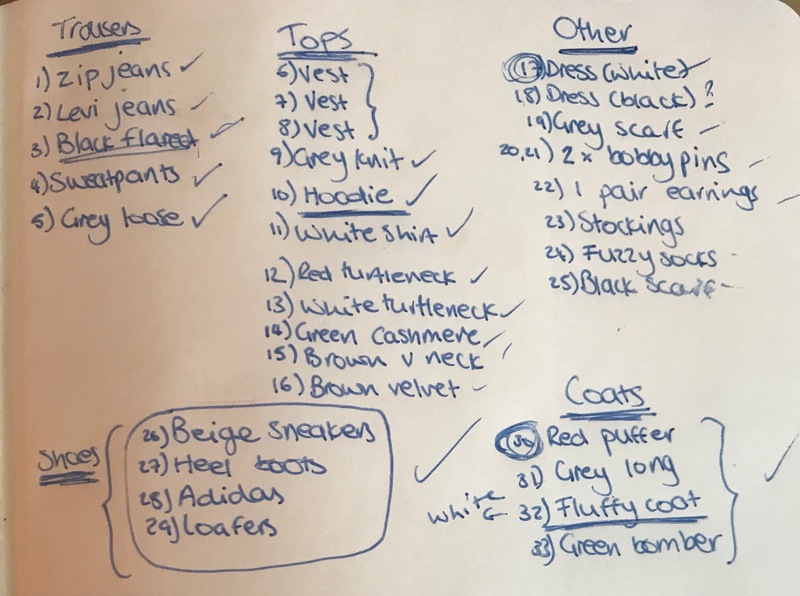 Attached to this post is a list I made of the 33 items at the start of this challenge. Now, about the experience. Frankly it is much harder than it sounds. I read the guidelines to this post and I thought that it would be a piece of cake. Both fortunately and unfortunately, it wasn’t. The first few days were perfect, everything was laid out, and most of my outfits were planned. But I didn’t realise I was only planning short term. I had chosen outfits for several days, instead of outfits for a month and a half, and outfits that were weather appropriate. For example, on the day of the first snow, I was very warm because of the clothes I selected, however I was unsteady when walking because I didn’t choose the correct shoes to wear for this weather. My snow boots were in the locked closet. I was slipping and sliding in the snow because I was wearing sneakers. I spoke to my friend Aya, about this challenge. And she agreed to help record my process. I see Aya every second day as we live in the same building. Occasionally, she would come to check up on my closets, just to ensure the second one was untouched. In the beginning she believed that I “wouldn’t be able to complete this challenge throughout the rest of the semester” but after thanksgiving break, she realised how seriously I was taking this. She thought the idea of Project 333 was incredible, but stated that she wasn’t “brave enough to try it”. However, I have made it my goal to convince her that it will change her perspective on excessive clothing, and eventually we will be trying it together. I recorded an ‘interview’ with her about this challenge and her look on it, which is attached to this post. Looking back on my process really amazed me as I didn’t believe in myself at the beginning. It was challenging, especially because I’m a huge fashion lover, the type of person who would sacrifice being cold just to have a good outfit. This project taught me so much more than that, and I have a different look on it all together. In fact, I look at it as a learning experience. In conclusion, I think that this project was a success, and also satisfying. I finally understand the “less is more” mantra. This inspired me to go through my clothes in the locked closet, and take an extra bag home to Zimbabwe with me, to donate to the Emerald Hill Orphanage, and other organisations close to where I live. I look forward to next semester where I can focus on this for the full 3 months rather than half of it.